Len Hering, a retired Rear Admiral from the U.S. Navy, gave an absolutely wonderful speech during the closing general session of the conference. You might want to share a link to it (listen below) with your friends and family and perhaps even the EPA! 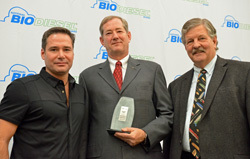 In addition he received an NBB Eye on Biodiesel Inspiration Award. Len is also the Executive Director of the California Center for Sustainable Energy. Hering, is a prominent military and civilian sustainability leader instrumental in bringing B20 to naval bases. In his 32 years of Navy service he was known as a top expert in base operations and facility support with an emphasis on sustainability. His efforts included everything from renewable energy, including biodiesel, to responsible water use, photovoltaic technology, and conservation. Within three years, his team reduced energy consumption by nearly 42 percent, diverted 75 percent of Navy waste from landfills and reduced water consumption by more than one billion gallons, saving tens of millions of taxpayer dollars. President Bush awarded Hering a 2005 Presidential Award for Leadership in Federal Energy Management.